Birmingham put the numbers to its job market and found a lot of work to be done. For one, its IT segment grew 77 percent in five years, creating a job gap that will grow over the next decade. Last June, Birmingham’s business leaders gathered at the Alabama Workforce Training Center for the release of the “Building (it) Together” report, a thorough, data-based analysis of Greater Birmingham’s workforce needs and potential for growth. To address this problem, the study offered detailed suggestions for better educating the local workforce, boosting entrepreneurship and investing in diverse, promising industries. The study was conducted by analytics software company Burning Glass Technologies and the Council for Adult and Experiential Learning (CAEL). More than 125 local representatives participated in focus groups to gather insight on Greater Birmingham’s current economic situation. Members of the Bold Goals Coalition of Central Alabama’s Workforce Action Network funded the study and have spent the last six months analyzing and acting on the results. One of the first issues facing the region’s workforce is the immediate departure of recent graduates. “We need more people with at least a bachelor’s level,” Jackson says. “Everyone knew we needed it, but now we’ve seen the numbers.” According to the study, 43 percent of local college graduates and 53 percent of doctoral graduates leave. Now the report’s organizers are looking for areas where they can open new internships and co-op opportunities, starting at the high school level, to help students build local connections. The Onboard Birmingham program partners with companies across multiple industries, including healthcare, law, education, finance and marketing. While young professionals can build a diverse network and become better acquainted with the city, employers can expect a greater likelihood of their talent remaining in town and investing in the community. The tighter network and local affinity are strategically fostered to keep young professionals in Birmingham. Management positions also have proven hard to fill. In its research and discussions with IT leaders, the report determined that there are indeed software professionals with the requisite five to seven years of experience, but they are hesitant to leave their current jobs. “There’s been an increase in young professional talent, but it’s been difficult to recruit experienced professionals,” Singh says. This apprehension has proven particularly harmful to the city’s startup potential. “While the region has taken strides to foster entrepreneurship, employers and entrepreneurial leaders cite a fear of taking risks in new fields as a consistent barrier,” the report states. “The talent supply gap is especially pronounced in jobs related to IT, and our region is already taking steps to educate and train more individuals to fill these positions,” says Suzanne Austin, senior vice provost and senior international officer at the University of Alabama at Birmingham. The need for IT jobs grew by 77 percent from 2010 to 2015, and the supply gap could continue to expand over the next 10 years. Innovate Birmingham was launched in 2017 to prepare young adults for careers in IT and software development. The previous year, the U.S. Department of Labor awarded Birmingham a $6 million grant to educate the city’s underemployed young adults in those fields. The program was designed with a four-year goal of placing 925 individuals into IT jobs. In light of the Building (it) Together study, Innovate Birmingham also will offer apprenticeship opportunities for hands-on experience. In light of the imbalance between life science graduates and available jobs, educational institutions, particularly UAB, are adapting to better serve both students and the future of their field. While unemployment in Alabama has dropped, that progress is not equivalent across all demographics. The region’s African American population faces unemployment rates higher than 10 percent. The report calls for better training for underrepresented groups in fields with potential to grow. The report also emphasized Birmingham’s overreliance on non-traded industries that only circulate goods and services locally. Traded industries that bring new income into the local economy make up just 28.8 percent of Birmingham’s employment, below the national average of 36 percent. Growth in Birmingham’s existing traded industries has fallen due to a combination of low-skill work and low pay. Many production jobs in these fields also stand to be automated in the future. “Communities without a robust traded industry mix, and the associated ‘employment multipliers,’ can be harder hit by economic recessions,” the report warns. Business services and distribution and electronic commerce were identified as the city’s top traded industries. In 2015, business services accounted for 22,592 jobs while distribution and electronic commerce contributed 20,098. However, both fields were down from their 2010 numbers. The report does credit Honda and Mercedes as exemplary sources of outside income. “The recent growth of automobile manufacturing in Greater Birmingham is a strong signal that it can develop as an advanced manufacturing hub,” it notes. 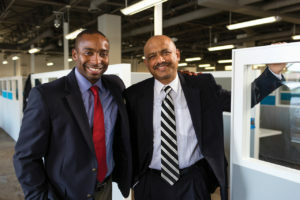 Singh also suggests increased focus on technology-enabled healthcare, which can be conducted remotely in Birmingham for patients around the U.S. Other technology-enabled services like Shipt and Fleetio already serve clients around the country and globe respectively, and have elevated Birmingham’s image as a viable startup environment. Tom Little and Art Meripol are freelance contributors to Business Alabama. Both are based in Birmingham.